The second iteration of Networked Narratives has been over for at least a few weeks now, and I’ve had a version of this reflection sort of sitting here in my blog draft bin. I’ve watched Alan Levine, one of the instructors, post his reflection yesterday from a teacher perspective (which was insightful to peruse). I’ve read through and enjoyed Wendy Taleo‘s reflection and presentation she gave about a project in Networked Narratives that we launched. I’ve skimmed through some of the final posts by the university students who took NetNarr for credit at their university. What I continue to find intriguing is the open invitation by Alan and Mia Zamora for anyone to follow NetNarr and participate, and so I and some others (like Wendy and Sarah Honeychurch) have done so. We’ve come and gone, as we pleased. Added to conversations. Commented on blogs. Disappeared from time to time. Re-appeared suddenly. Engaged. Created. Made. Remixed. Being out here in the Wild Open, as I often refer to it, has its advantages (we can engage where our curiosity is piqued and ignore the rest) and disadvantages (we aren’t always part of the larger conversation that comes from being in the class at the university, and seem to be invisible at times). Here, in this NetNarr reflection, I want to share out a few projects that I took on that formed my framework of interaction, or at least, the hope for interaction. One of the three was more successful in this than the other two, but the other two were meaningful to me anyway. First, when Mia and Alan announced this second round of Networked Narratives with the theme of Digital Life, I was interested. I had had fun with the first round of NetNarr a year ago, and figured, I’ll just see what they’re up to this time. I decided to bring a comic strip character out of hiding, and wanted to weave a story about Arganee –the fictional world of the first NetNarr — and digital alchemy, a theme of inquiry for NetNarr. So, I wrote a story about Horse, the companion to The Internet Kid, and left the Kid at home. I remember being obsessed with telling this story in comics, and working very diligently on the storyline. I released the comic story, one comic at time, into the NetNarr hashtag, and then bundled the entire thing up into a graphic story adventure. 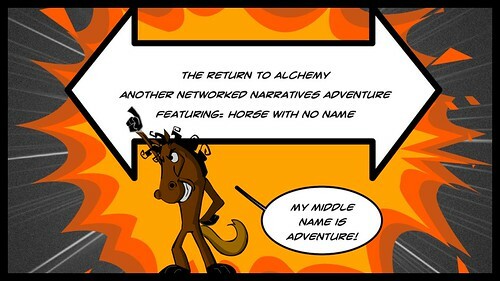 I really enjoyed this Horse with No Name comic project, but I got almost no response from the NetNarr students or participants (Wendy and I did a little exchange now and then), and I wonder if those students even knew that the Horse story was always part of NetNarr. Or if they just thought some weirdo was releasing comics into their midst. Second, I also tried to do the Daily Arganee prompts, every single day. My aim was to come at each prompt from a slant, and to be as poetic as I could. I used the app called Legend for its animated text and visual image feature, but its text limits forced me to edit and narrow the poems to their core. Some were more successful than others. This YouTube Playlist gathers up six small collections I made throughout the three months of NetNarr. Again, there was very little reaction to any of the poems, although I did them mostly for myself, and the challenge of writing small pieces on an angle from a prompt. Over the course of weeks, a group of us planned out how to invite collaborators to use media to tell stories of assigned objects, which were then woven into the Alchemy Lab — an immersive 360 degree art project using ThingLink. This project took the most time and coordination, and the result is something magical — a collaborative art piece that weaves story and media together in a fun way, showcasing how people can come together to create and make and learn. I wrote three long reflective pieces just about the Alchemy Lab endeavor. This project continues, in a way, as we share out individual pieces each, with an invite into the lab. Yes, you are invited, too. Come on in. The narrative is networked. Finally, I want to share a project that had on the surface seemingly nothing to do with Networked Narratives, and yet … it did, in my mind at least. 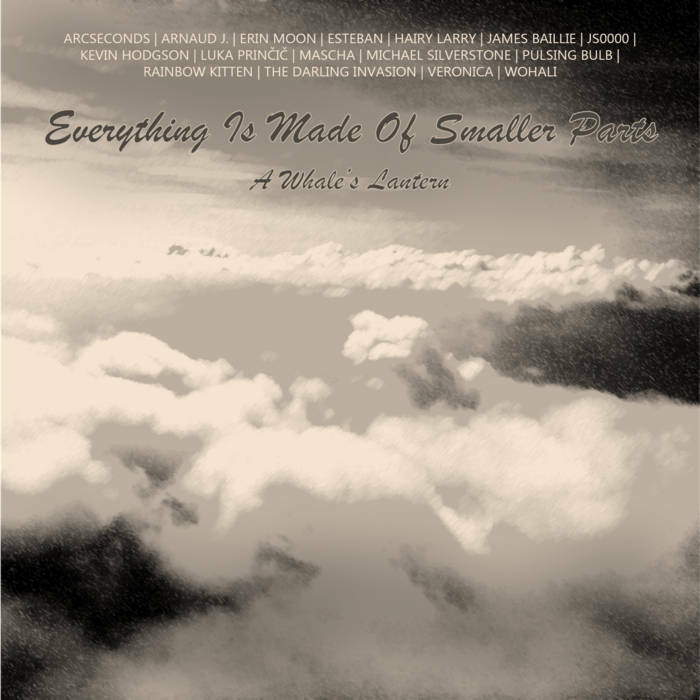 It is a music collaboration project called A Whale’s Lantern, in which online music collaborators from all over the world work on writing and producing a song, which then becomes part of a larger “album” of music. The reason I include this here in the NetNarr reflection is that I saw/see A Whale’s Lantern project as part of the larger aims of Networked Narratives — of finding ways to connect people from around the world with media creation (in this case, music) as connector points for collaboration, using the Internet as a way to publish and interact in a meaningful, authentic way. It didn’t matter that this took place off Mastodon as opposed to Twitter, or that I was the only one making the NetNarr connections (although Wendy may have seen that connection, too, as she dipped her toes into the music collaboration). The point is that the very things that we all looked at in NetNarr around the positive elements of our Digital Lives — of following your passions and engaging in virtual strangers with similar passions to create something unique, together, with technology and media — played out beautifully here, overlapping at the same time I was engaged in NetNarr. 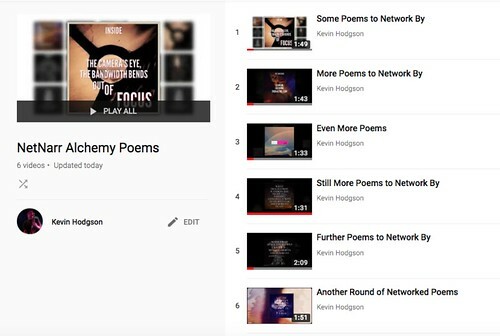 And, to make the connection even clearer, the lyrics I wrote for my collaboration with my partner, Luka, was inspired by Networked Narratives itself and the idea of digital alchemy. The song is called Alchemist Dream, and you can find the lyrics here. How’s that for synergy? Thank you, Mia and Alan, for at least trying to find way to fuse classroom experiences at the university level with the open learning networks beyond the classroom walls. I still wish there were more ways to interact among the two groups — the Wild Open and the classroom — but realize the logistics would be difficult to navigate and the demands of running a university course are different from facilitating an open learning adventure. Still … imagine the possibilities. This entry was posted in comics, Internet Kid Comic, Mastodon, music, NetNarr, Songwriting. Bookmark the permalink. Kevin, I love your persistence and creativity with a goal of creating open learning networks connecting learners from beyond the classroom walls. I envision an even larger Wild Open classroom of people throughout the world connecting to find ways to make the planet a safer, better place for everyone to live, work and play. Kevin, I cannot thank you sufficiently for all you add to the #netnarr experience, and I know the flow back from the class might feel negligible. I hope you trust that even not explicitly noticed or recognized, just having a loose flow of people outside the registered students does create a more dynamic space. It was a huge load just to keep everything moving. And what’s so bad about giraffes? Giraffes are cool. Unless you are a horse. I guess. I do trust that the spaces we inhabit, often, are the spaces I want to be, and to stick with, and to help grow and to grow with. You always bring to light the magic that is really possible in open connected learning. I am deeply grateful for -your responsiveness, -your ability to listen and pay attention, -to create a-new, and -to tie unforeseen threads of connection. This Spring has been an interesting #NetNarr interlude for me. My own institutional constraints (i.e. 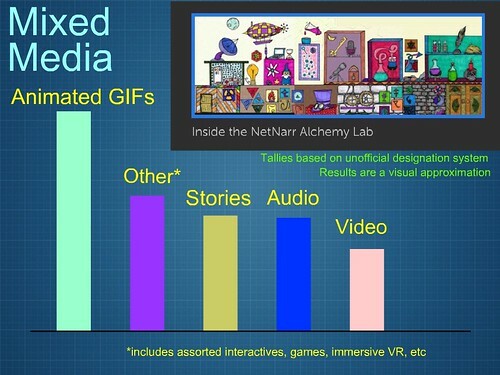 75 Ss for class size, digital genres content requirements, large lecture halls, required midterms, etc) came as antithetical to my design instinct and our overall connected learning #NetNarr recipe. And yet, there was much dynamism in our networked learning moments. So, thank you. Thanks for your critical contribution to that!! Thanks, Mia. I am always interested in following your adventures, and tagging along to learn when I can.